The 'Balance in Life' e-newsletter - your chance to see how 'Boost Your Life - Reinforce Your Self Esteem' works in practice. Only for subscribers. The FREE 'Balance in Life' monthly e-newsletter (email magazine or e-zine) is for all who wish to explore themselves, their interaction with others and their place in the world. 'Balance in Life' will provide you with information and inspiration to help you get the most of out your life. All in all, I cannot wait to read it myself! Want to find out about previous issues and their content - visit the 'Back Issues' page. 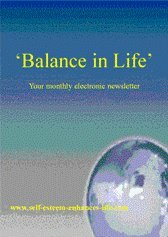 Why not store the 'Balance in Life' monthly e-newsletter for future reference? To make the most of your 'Balance in Life' newsletter why not create a folder and save them away. To be referred to whenever you want. They can help you at a later date in your journey through life. Simply fill out the form below and hit the subscribe button. You will receive a confirmatory email and, later, the next available issue of the monthly 'Balance in Life' newsletter in your Inbox. Receive your free newsletter at the beginning of each and every month. I am confident that you will find something in each month's 'Balance in Life' newsletter that you will want to continue receiving them on a regular basis. However, if you should ever want to unsubscribe, for any reason, you can do so through the link at the end of any 'Balance in Life' newsletter issue.